On Earthgauge Radio this week, we continue with our ‘best of’ summer series with a program originally broadcast back in January on an issue that only continues to grow in importance: the proposed Enbridge Northern Gateway Pipeline. Hearings of the National Energy Board looking into the pipeline proposal got underway in B.C. back in January with over 4000 people scheduled to speak as intervenors. The oil industry in Canada and the federal government are pushing hard to see that the pipeline is built, yet opposition to the project, particularly among First Nations communities along the proposed pipeline route, is fierce. Just last week at a meeting of Canadian premiers, BC premier Christy Clark insisted that her province should receive more economic benefits if the pipeline is built as BC is shouldering all the environmental risk. Alberta premier Alison Redford, who is trying to push forward a national energy strategy, promptly rejected Clark’s demands. So what’s all this about? If constructed, the Northern Gateway pipeline would transport heavy bitumen oil from the tar sands of northern Alberta to the north coast of BC. 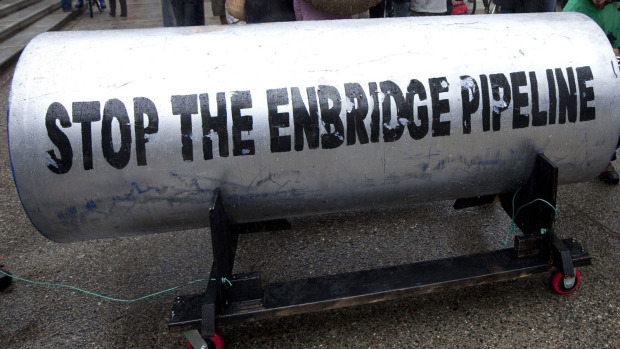 The pipeline company Enbridge wants to build two 1200km pipelines – one would take 500,000 barrels a day of tar sands crude across the Rockies to Kitimat on the B.C. coast, where over 200 supertankers a year would take the oil for export to the U.S. and Asia. A second pipeline in the other direction would take a natural gas condensate back to the tar sands, which helps the oil flow through the pipe. The pipelines would cross hundreds of rivers and streams and pass through a region renowned for its salmon, wolves, bears and other wildlife. It would also help to triple the production of tar sands crude, which is among the dirtiest and most destructive forms of energy, thereby greatly increasing Canada’s greenhouse gas emissions. Although the National Energy Board hearings looking into the costs and benefits of the project have not yet concluded, the federal government has already weighed in with Prime Minister Stephen Harper saying that the pipeline is in the national interest and must proceed while federal Natural Resources Minister Joe Oliver has labelled those opposed to the project, which includes environmentalists, fishermen, ranchers, ordinary citizens and First Nations, as foreign-funded radicals. Not surprisingly, the proposed project has sparked an eruption of opposition among those who see the possibility of an oil spill as a critical threat to the environment and the livelihoods of tens of thousands of people. Northern Gateway would have to cross the lands and waters of many BC First Nations, the vast majority of whom are opposed to the project, some maintaining that it must be stopped at almost any cost. Last December, 130 aboriginal groups in B.C. said they were joining forces to use “whatever means necessary” to stop the project. And back in March the Harper govt really put the boot to environmental groups by releasing a Budget that would allow the Conservative Cabinet to overrule any final decision of the National Energy Board, effectively rendering the hearings a useless token exercise. And if this wasn’t enough to satisfy the PM’s contempt for all things environmental, the government also announced $8 million in new spending to investigate the political activities of charitable orgs by which just about every observer takes to mean those pesky environmental groups. The Harper government has also retroactively limited the time length of reviews of major resource projects, thereby effectively cutting short the NEB hearings, which, because of the sheer massive scale of the project were scheduled to continue into next year. Now they could well be over within a matter of months. One thing we can say for sure – a long and bitter fight lies ahead with some calling it the most significant environmental battle in Canadian history. So given that it’s been in the news once again and will continue to be for some time to come, today on Earthgauge Radio I re-broadcast our special program from January of this year on Gateway. First we hear from Emma Gilchrist of the Dogwood Initiative who talks about some of the possible environmental impacts of the project and updates us on the progress of the NEB hearings. Then we hear from the respected geologist David Hughes who discusses whether there is even a need for the project from the perspective of Canada’s strategic energy reserves. And finally for the political perspective I speak with the journalist Murray Dobbin who fills us in on how the federal government is manoeuvring to ensure that the project be approved despite all the opposition to it. Earthgauge Radio is broadcast every other Thursday morning at 7:00-8:00 AM on CKCU 93.1 FM in Ottawa. Online at http://www.ckcufm.com with podcasts on iTunes.